BRUSH PRAIRIE — They don’t need a phone to look up the information. They don’t need a calendar to confirm. They know. They will always know. “December 2nd, 10 a.m.,” Kyle Brabec says. Yes, they remember the time, too. That was the unusual thing about that day, the time. They had never kicked off a varsity football game at that time. The next two hours or so, everything went the same as the previous 13 games for the Hockinson Hawks. They played the game, they won the game. Only this one was the last game of the season. This was in the Tacoma Dome. And this one made them Washington Interscholastic Activities Association state champions. ClarkCountyToday.com is naming Dec. 2, 2017 as the best sports day for the county for the the academic year of 2017-18. It was the first state title for the Hockinson football program. Players and coaches understand, though, that this was not just their title. “Being able to share this with the community has been crazy,” said Brabec, a defensive end. 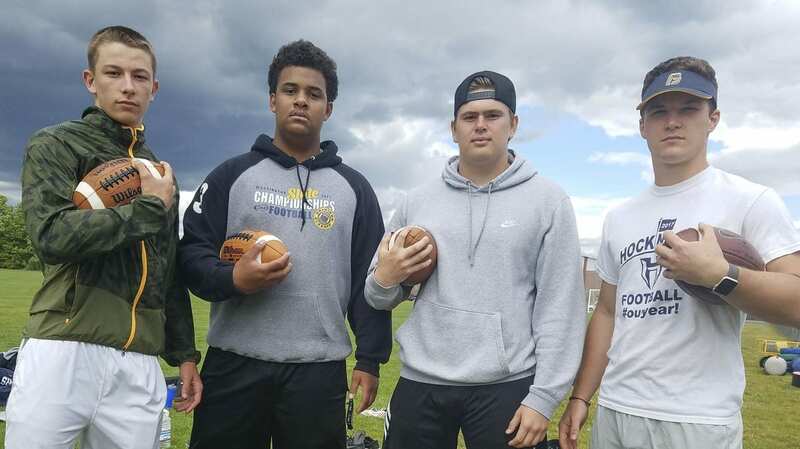 Four members of the team – Brabec, quarterback Canon Racanelli, lineman Kordell Johnson, and running back Bailey Jones — visited with ClarkCountyToday.com on Thursday to remember that big day and how life has treated them since then. For many players, championship day started at 3 a.m. That’s right, 3 a.m. A fire alarm went off at their hotel. Some of the Hawks followed the leadership of their quarterback … into an elevator. “Yes, yes, our quarterback took the elevator during the fire alarm,” Brabec said. And there might have been too many Hawks who followed. The elevator got stuck. “We may have exceed the capacity,” Racanelli acknowledged. Oh well, it was only bad decision of the day. Besides the early wake-up, the Hawks learned to love the early start time for their game against Tumwater. The Saturday of Championship Weekend consists of four games in the Tacoma Dome. It was the Class 2A game that drew the breakfast assignment. It was all Hockinson for the last three quarters in a 35-22 victory. Racanelli, who would go on to be named the state Player of the Year for all classifications by Cascadia Preps, threw for 316 yards and three touchdowns that day. Looking into the stands, the Hawks were mesmerized by the numbers. “All of Hockinson,” Racanelli said. Soon enough, the Hawks would find more benefits to playing the early game. A two-hour ride home left plenty more time for celebration. As the Hawks got closer to town, it started to hit them how big of a deal this had become for their fans. “And we still had the whole entire night,” Brabeck said, noting many of the players went to Mill Creek Pub, a restaurant in Battle Ground that was giving out free food to any state football champion. The night turned into morning, but the Hawks were still in celebration mood. They went to Elmer’s Restaurant on Sunday and got a standing ovation. Nearly six months later, the Hawks are still enjoying their accomplishment, and making fun of each other. Especially Racanelli, who because of his incredible performance throughout the season, received a whole lot of media attention. Jones jokingly wonders how many yards he would have gained if his quarterback would have, you know, actually handed him the ball. “He’s so full of it,” Racanelli responded. Racanelli’s famous competitiveness got the best of him early in his career, sometimes yelling at teammates at the wrong time. During this championship season, though, the coaches told the linemen that if Racanelli ever yelled at them, they could put him in his place. “Know how many times I yelled at them?” Racanelli asked, before putting his fingers in the shape of a zero. Hockinson coach Rick Steele said he still watches the championship game at least once a month. Johnson was surprised to learn that, admitting he has never watched the game. “You never watched film during the season,” Brabec fired at Johnson. Fun little things have happened to the Hawks since winning it all. Brabec was wearing a Hockinson shirt while on vacation in Florida when someone recognized he was a member of a state championship football team. Racanelli did say the hype has calmed down the last few months, but it is not completely quiet. “There isn’t a day goes by that someone doesn’t talk about the state championship,” Racanelli said. “I was wondering, ‘What could have made this season better?’ The answer: Nothing,” Racanelli said. Some 10, 20, 30 years from now, the Hawks will still be making fun of each other. Some 10, 20, 30 years from now, they will always be champions, too.